Visual Basic is a tool that allows developing the windows (Graphical User Interface) application. Visual Basic is a language type program. It is governed by an event processor. Programming Concept:- A set of logical introduction to the computer system by which we can instruct the computer. Flow Chart:- A graphic repetition of the program logical is called Flow Chart. Algorithm:- The art of calculation by the program and a texture the presentation of programming logical is called Algorithm symbol of Flow Chart. Such as- Start input, Stop etc. 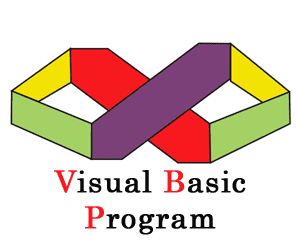 The extension name of Visual Basic program is ‘.vbp’. What is the full form of BASIC? ‘John G. Kemeny’ and ‘Tomas E. Kertz’ are known as the father of BASIC language. They have invented the BASIC language in 1964. They were the professor of ‘Dartmouth’ college from the USA. Full set of controls for draw the application. Lots of icons and picture for use. Response to mouse and keyboard actions. A full array of mathematical, string handling and graphic function. Useful debugger and error- handling facilities. Powerful database access tools etc. Create any program by using Visual Basic so at first install Visual Studio 6.0 in the computer then used Visual Basic 6.0. The necessary configuration of a computer for run Visual Basic 6.0 is- minimum Pentium-1 machine, 64 MB RAM, 600 MB Hard Disk, colour monitor, SVGA display, mouse, CD or DVD-ROM drive etc. Easy used by Text, Database or Binary files. Easy used and learn for the Visual Basic developed by GUI. Do not write any code to program for display the necessary component. The Visual Basic application connected another application by using OLE (Object Linking Embedding), Clipboard or DDE (Dynamic Data Exchange). Used many types of graphical format in Visual Basic. Like as- .bmp, .pcx, .jpg, .gif, .wmf etc. Need high configuration machine for Visual Basic. Only GUI based system software support Visual Basic. FORMS: - Windows that are to create the user interface. CONTROLS: - Graphic features drawn on forms to allow user instruction (e.g. Textbox, Label box, List box, Combo box, Command box, Frame etc). PROPERTIES: - Name, Text, Color, Size, Caption etc. METHODS: - Cls, Print, Set focus, Add item, colour, Visible, Remove item, Text etc. EVENT PROCEDURES: - code related to the same object. This is the code that is executed when a certain event occurs. GENERAL PROCEDURES: - Code not related to an object. This code must be invoked by the application. MODULES: - Collection of general procedures, variable declaration and constant definitions used by the application. How many steps of developing the application in Visual Basic? Draw the user interface by placing the control on the form. Attach code to control events. Byte: - Range of values from 0 to 255. Need 8 bits or 1 bytes memory for Byte Data type variable. Integer: - This Data type is used to store for variable any number from -32, 768 to 32, 767. Need 16 bits or 2 bytes memory for Integer Data type variable. Long: - This Data type is used to store for variable any number from -2147, 483,648 to 2147,483,647. Need 32 bits or 4 bytes memory for Long Data type variable. Single: - This Data type is used to store the variable decimal number. Need 32 bits or 4 bytes memory for Single Data type variable. Double: - This Data type is used to store the variable decimal number. Need 64 bits or 8 bytes memory for Double Data type variable. Currency: - This Data type is used to store for variable Currency. Need 64 bits or 8 bytes memory for Double Data type variable. Boolean: - This Data type is used to take decision ‘True’ or ‘False’. Need 16 bits or 2 bytes memory for Boolean Datatype variable. Date: - This Data type is used to store for variable Date or Time. Need 64 bits or 8 bytes memory for Date Data type variable. Use ‘#’ sign before and after the date. Like as- #08/25/2016#. Object: - This Data type is used to any object’s reference. Need 32 bits or 4 bytes memory for Object Data type variable. String: - This Data type is used to store for variable characters from 0 to 2 billion. Need varies memory for String Data type variable. Variant: - This Data type is used to store for variable characters or numeric. Need varies memory for Variant Data type variable.